Today, the San Andreas Fault has become world famous thanks to the expected catastrophe - the historic mega-earthquake (MegaQuake) accompanied by a tsunami. However, extraterrestrials and predictions of Edgar Cayce inform that the San Andreas MegaQuake is not a separate event, but the beginning of a chain of cataclysms of the apocalypse. The cataclysms of the apocalypse possibly will not begin this year. Edgar Cayce, as it is known, predicted that the 44th US president Barack Obama will be the last. Since the election of the 45th US President is scheduled for November 8, 2016, the predictions of Cayce about the last 44 President of the United States means that cataclysms of the End of the World have to begin this year. Despite to this prediction of Cayce, cataclysms of apocalypse possibly will not begin this year. However, the date, pointed by him, means that they are already on the threshold. E. Cayce and extraterrestrials indicated one direction of the blow. Extraterrestrials have not specified the year of the beginning of the End of the World, however, they presented its complete scenario. It includes three all growing pre-cataclysms that will occur during one year before the start of global. Extraterrestrials informed about the dates of their beginning, the epicenters and the directions of the main blow, as well as the losses of humanity in each of them. Extraterrestrials warn that all three pre-cataclysms will be mega-tsunami, and the epicenters of the first and the second pre-cataclysms will be in the Gulf of Mexico. San Andreas is the beginning of the apocalypse. Consequently, predicted by Edgar Cayce the destruction of the west coast of America, will happen, obviously, as the result of the expected in California the historic MegaQuake San Andreas. Just it, will be the beginning of the apocalypse. Thus, in accordance with the predictions of E. Cayce and information of extraterrestrial civilizations mega earthquake of the San Andreas on the west coast of America is the preamble of another cataclysm, more powerful and devastating - the first pre-cataclysm of the End of the World, with its epicenter in the Gulf of Mexico, which as mega-tsunami, will hit already the US east coast. The mega-earthquake San Andreas can immediately transform into a mega-tsunami from the Gulf of Mexico, or through short period of time. The San Andreas Fault. Close reality of the beginning of the catastrophe confirms the critical state of tectonic San Andreas Fault, passing along the west coast of North America. According to experts, the fault is completely prepared for a mega earthquake. As it is known, the San Andreas Fault – is the longest and the most active in the world tectonic fault between the Pacific and North American plates. The depth of the fault reaches about 16 km, and its entire length - about 1,300 km - runs along the coast of California (USA), mostly on land. The San Andreas Fault begins in Mexico, crosses the state California from south to north, passing near Los Angeles through San Bernardino, and goes into the ocean straight under San Francisco. The San Andreas Fault is a continental transform fault, because the two plates slide along each other, its motion isright-lateral strike-slip (horizontal). They move at a speed of about 5 cm per year. Thus, the epicenters of earthquake near the continental transform faults, are located not deep, usually less than 30 km depth under the Earth's surface. The tension, caused by the movement of the plates, are absorbed and accumulated, gradually reaching a critical value. Then, instantly, plates are shifted, rocks are cracked, and an earthquake happens with its epicenter on a fault line. Scientists warnthat the San Andreas Fault, «as the computer is loaded and is ready to work,» i.e., to the historically powerful mega-earthquake accompanied by a tsunami. As it is known, the last major earthquakes in the San Andreas Fault had occurred in 1857 and 1906. So, a long lull in this region indicates that the tension between the plates is constantly increasing, and the output of energy will be catastrophic. «More than a century is almost silent here, and it is very disturbing», - said Thomas Jordan, the Director of the Southern California Earthquake Center. Experts warn that between the plates had accumulated a powerful tension and the released energy will be comparable with nuclear charge of hundreds megatons. Seismologists predict that the strength of the San Andreas earthquake could reach 9.2 points. To refine the forecast of the state San Andreas Fault in May 2016 was convened the National Congress of seismologists. The results were manifested as conducting of the massive training for this catastrophe involving the National Guard of the country. Expansion of the catastrophe due to the parallel faults. Close to the San Andreas Fault, parallel to it, are located also other faults, including the San Gabriel and San Jacinto, also dextral. With the fault are connected earthquakes, reaching magnitude 8.1, which cause surface displacements up to 7 m.
Scientists consider that at the moment of future mega-earthquake, the parallel faults can also be activated and greatly expand the territory of the catastrophe due to the resonant earthquakes and the growing instability of the Earth's crust of the planet. The part of the Ring of Fire. In addition, it is important to note that the entire western coast of the United States lies along the Ring of Fire, nearly every part of which today is extremely activated, and ready for action. This greatly increases the possibility of the imminent start of the earthquake on the San Andreas Fault. The Pacific Ring of Fireis an area at the crossroads of oceanic and continental plates, in which are located a large part of the Earth's active volcanoes and happen the largest number of tremors and earthquakes. This is the area of the most seismic activity on Earth. Scientists consider that the Ring of Fire entered in seismically dangerous period. The Ring of Fire – the tectonic fault that runs along the edges of the entire Pacific Ocean from Kamchatka through the Kuril Islands, Japan, Philippines and New Zealand, runs along the Antarctic and further through the West coast of South and North America. On the Pacific Ring of Fire there are 452 active volcanoes of 540 known in the world, i.e. 75% of the total number of active volcanoes of our planet. In the Pacific Ring of Fire occurred around 90% of the world's earthquakes and 80% of the most powerful in history. The prediction of Nostradamus makes an important warning to the description of the events of this time: «The total blood will flood the earth, people will live with their mouths closed, and unpredictable will come ....» Unpredictable – is radiation, unknown at that time phenomenon, which will close people’ mouths, contaminating water and food. Radiation on the planet will occur as a result of the destruction of numerous nuclear power plants under crushing blows of nature. Among the first, obviously, will be the Diablo Canyon Power Plant, located midway between Los Angeles and San Francisco, just 2 miles from the powerful the Hosgri Fault – component of the system the San Andreas Fault. On the map on the right is shown the location of the Hosgri Fault depicted as the orange line on the western side of the map with respect to the San Andreas Fault, depicted in red. The two keys to the symbolics of consciousness for reading the Instructions for continuation of life. In the events related to the huge human losses, should not be chaos, because chaos arises from the absence of information and, in this case, means the destruction of civilization. Extraterrestrials do not allow such a development of the events. They gave the Scenario of the End of the World events and the detailed Instructions that will allow to make the Transition. Extraterrestrials presented the Scenario of the End of the World in numerous stone complexes-pictograms. However, they transferred the information by symbols of consciousness, unknown to mankind. We were given from the Above the two Keys for reading this symbolics – analog-digital, and also the Law of action of the united consciousness. The Keys allowed to decode many hundreds of pictograms of extraterrestrials, built around the world and to understand this Scenario. As a result, we composed «The Dictionary of analog and digital symbols of consciousness» of extraterrestrial civilizations of over 300 symbols. The main, that simultaneously with the information about destroying cataclysms, extraterrestrials indicated to humanity the only way of salvation. It is the Transition to the next cycle of life on the parallel safety Highest level of the material world in the harmony of the Earth, without cataclysms. They transferred also the detailed Instructions about how to make this Transition. The inverted cross of St. Peter, as a warning about the necessity for overturn of consciousness.In the nearest time on Earth will begin global cataclysms due to the divergence of tectonic plates. Extraterrestrials indicate the only one way of survival – the Transition to the secure Highest level of the material world. However, the Transition is connected with a body transformation on the base of unknown to humanity the Law of the action of the united consciousness. Extraterrestrial civilizations gave the detailed Instructions about how to make this Transition. The united consciousness of mankind should ignite a laser ray of incredible power that will destroy bodies at the level of the Crystal Structures and at the same moment, will happen the general resurrection at the Highest level of the material world. This way the civilization will make the Transition and will continue life in the cycle of Correction. Creating a laser beam for the Transition is possible only on the base of the incredible unity of consciousness of the people of Earth through deliberate overturn of consciousness from hate to love and mutual understanding. About the necessity of overturn of consciousness for continuation of life for two millennia warns the inverted cross of St. Peter. The dates of cataclysms - precautionary light alarm system.For transfer information about the dates of cataclysms of the End of the World, extraterrestrials had built on the planet many complexes-pictograms with light effects, which determine the four dates deadly dangerous for mankind - the days of autumn and spring equinoxes, and also summer and winter solstices. These complexes include Stonehenge and New Grange, Chavin de Huantar, Loughcrew, Maeshowe, Dowth, Knowth and others. Among the complexes with light effects is allocated one - with the shadow effect of the descending serpent - symbol of the cataclysm in the symbolics of consciousness. This incredible effect appears on the pyramid of Kukulkan at Chichen Itza, Mexico twice a year - on autumn and spring equinoxes. An incredible spectacle attracts tens of thousands of people from around the world. This way extraterrestrials warn people of Earth about the major events – the first and the second preliminary cataclysms, between which mankind has to make the Transition. The beginning of the second pre-cataclysm means the destruction of civilization, because the number of remaining people will be already insufficient to start the mechanism of the Transition. The dates of three pre-cataclysms. The shadow effects on Kukulkan pyramid inform humanity that the first pre-cataclysm will begin on the day of the autumn equinox, and the second pre-cataclysm – on the day of the spring equinox. Soon global cataclysms will begin. They will increase and continue for millions and millions of years, until the complete destruction of the planet, image of which today represents Pluto - the core left over from the once existed planet. The surface area of Pluto is approximately equal to the area of Russia. Strong earthquake and tsunami off the coast of Peru. 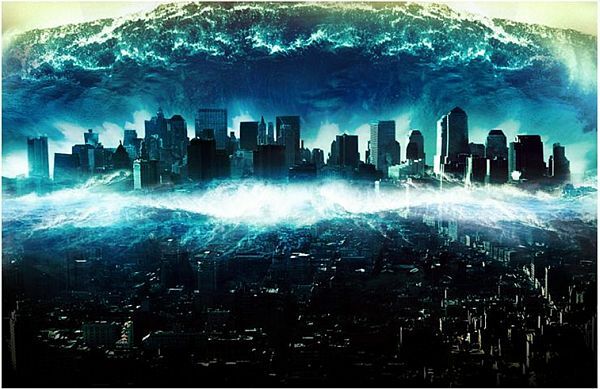 Extraterrestrials warn that with the first pre-cataclysm at the intersection of El Nino and the Humboldt Current a strong earthquake will occur, which will be followed by a tsunami. For millennia, the Keys to the gates of the kingdom of heaven belonged to the papacy. However, already is finished the time of improving of individual consciousness by the commandments and the formation of relationships on the planet, in accordance with the golden principle of morality - love your neighbor as yourself. The Transition into the kingdom of heaven on the Highest level of the material world, based on a body transformation - is an exam on the achievement the highest level of consciousness – the united consciousness of civilization. The Transition will be made according to the Instructions of extraterrestrials, written by symbols of consciousness. Therefore, replacement of the Keys means the transition from the individual consciousness to the united consciousness and will be indicated by the blow of destruction of their strongholds – Vatican, located in Rome. Mega-earthquake San Andreas, accompanied by a tsunami on the West coast of North America. The mega-earthquake San Andreas can directly transform into a mega-tsunami from the Gulf of Mexico, or through short period of time. Radiationwill arise. The first pre-cataclysm – September 22-23, the autumnal equinox. The epicenter is the Gulf of Mexico. The direction of the main blow is the east coast of North America. Flooding by water of oceans the remaining lands of North America and Western Europe. Under the water will be the west coast of England, Spain, Portugal, part of Japan. Strong radiation on the planet will arise due to the destruction of numerous nuclear power plants. The destruction of Rome, predicted by Saint Malachy. The second pre-cataclysm - March 20, the vernal equinox. The epicenter is the Gulf of Mexico. Coverage of large areas. Huge human losses. Start of the second pre-cataclysm means the destruction of civilization, because the number of remaining people will not be able to start the mechanism of the Transition. Strong earthquake, accompanied by a tsunami off the west coast of Peru at the intersection of El Nino and the Humboldt Current, will arise with the first pre-cataclysm. The third pre-cataclysm - June 20-21, the summer solstice. The fight for the Western Siberia is meaningless. Edgar Cayce predicted that only Russia and especially Western Siberia, will remain practically unaffected by cataclysms. But this is only for pre-cataclysms. Global cataclysms - will cover the entire planet and nowhere life cannot be continued. Extraterrestrials assert: or all mankind simultaneously will make the Transition, or the Earth's civilization will perish in global cataclysms. Hence, the struggle for Western Siberia is absolutely meaningless. The phases of planets destruction in the solar system. The aim of beginning of global cataclysms on Earth is complete destruction of the planet. Successive phases of this process can be easily traced in the solar system through the planets of the past development of consciousness in the direction from Earth to Pluto, i.e. in the opposite direction to the development of consciousness on them. The result of the first phase of global cataclysms development, in which enters planet Earth now, is a profound weakening of the magnetic field, the leaving of atmosphere, transformation mountains into piles of sand is presented on Mars. Last, the final phase is presented on the dwarf planet Pluto. Venus and Mercury are the planets, on which humanity will consistently improve consciousness after the cycle of Correction on the Highest level of the material world in the harmony of Earth. Our Transition is the first step on the way to life on these planets. «Salvation of the world will come from Russia.»Edgar Cayce predicted: «The hope of the world will come from Russia - not from Communists, not from Bolsheviks, but from free Russia! From Russia has to be expected the salvation of the world». And, indeed, to us, Russian scientists, the authors of this article, from the Above have been given the two Keys to the symbolics of consciousness. These keys allowed to decode the detailed Instructions for the Transition, which were transferred by extraterrestrial civilizations, as the only way for continuation of life at the occurrence of global cataclysms. The Instructions allow to convert a body for the Transition to the Highest level of the material world. The basis of the Transition is a deep mutual understanding and love between the people of the planet, corresponding to the principle - love your neighbor as yourself. About this brotherhood of people of the planet, which will arise in the period of planetary catastrophes, predicted E. Cayce.